On Monday, June 25, 2018, RCMP Commissioner Brenda Lucki appeared as a witness before the National Inquiry into Missing and Murdered Indigenous Women and Girls (MMIWG) at an Institutional Hearing in Regina, SK., that focused upon Police Policies and Practices. In prepared remarks, Commissioner Lucki acknowledged the families of the missing and murdered women, thanked them for the courage in speaking out and apologized to them, noting that “the RCMP was not the police service you needed it to be during this terrible time in your life”. Commissioner Lucki offered that the apology was extended as “one more step in the RCMP’s commitment to Reconciliation” between the Force and the indigenous communities in Canada. On July 5, 2018, President Steve Walker, RCMP Veterans’ Association, spoke with Commissioner Lucki and Assistant Commissioner Stephen White respecting the apology. President Walker said that Veterans fully empathize with the pain the families, friends and communities have gone through, and the loss they have suffered. At the same time, President Walker noted that many Veterans across the country had expressed strong discontent with the remarks, feeling that the statement discredited their life’s work within indigenous communities and reflected poorly upon their character and integrity. Many members spoke of the high standards and vigour they always applied to their investigative work, and the values of respect and integrity they comported themselves with in all investigations. 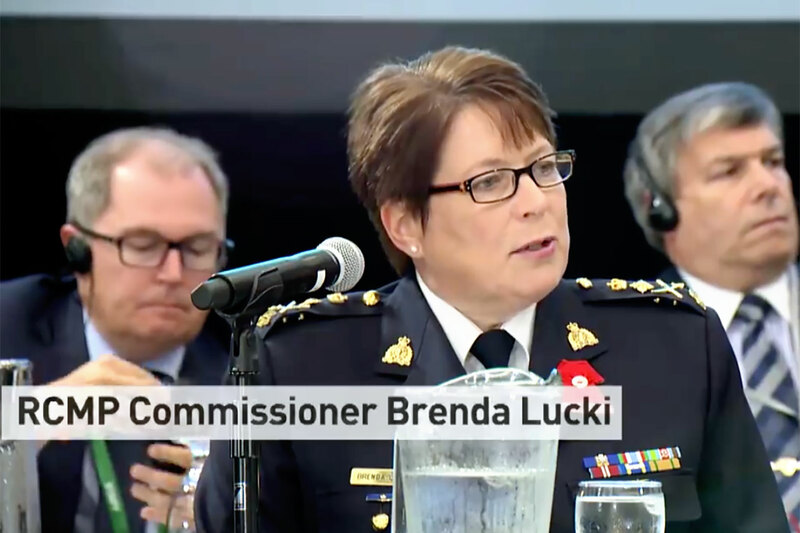 Commissioner Lucki noted that her statement was prepared following a significant review of material that determined that not all RCMP investigations were conducted without bias, or in a spirit and manner that reflected respect and sensitivity to the victims, the complainants and their families. This has also been borne out by testimony of family members who have appeared before the inquiry. Commissioner Lucki noted the incredibly difficult and tireless work so many RCMP members have performed in the past, and continue to perform today, to reunite families and to bring justice to victims and closure to their loved ones. Commissioner Lucki recognizes that the vast number of investigations were handled properly and concluded professionally. The apology was never meant to undermine the excellent and thorough work done by generations of RCMP officers over the past several decades. But it is intended to acknowledge the many cases where, regrettably, those same professional standards were not applied, and where disrespect was incurred. The Commissioner reaffirmed the commitment of former Commissioner Bob Paulson of legal support of the RCMP for Veterans in event of litigation that could evolve from the Inquiry. Commissioner Lucki stated that the relationship with the RCMP Veterans’ community remains vitally important to the Force, and the Commissioner and her officers will continue to liaise with the Association in the months ahead as other challenges are addressed as the RCMP modernizes its structure and procedures.